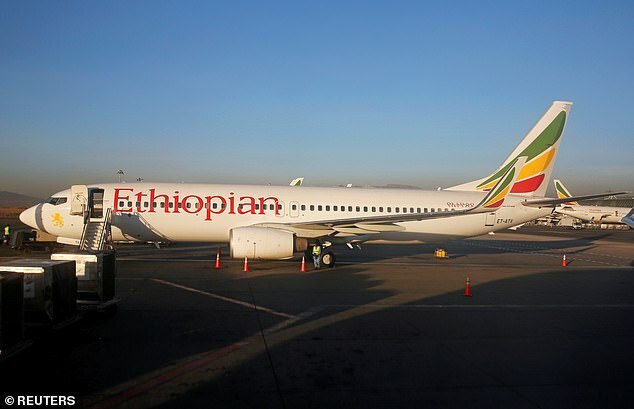 The tragic deaths of 157 passengers and crew today, when an Ethiopian Airlines Boeing 737 Max 8 aircraft crashed within minutes of take-off in Addis Ababa, are raising serious questions over the safety record of both aircraft and airline. It was on another brand new Boeing 737 Max 8, in Indonesia less than five months ago, that 189 people lost their lives in the Java Sea when Lion Air Flight 610 plummeted out of the skies minutes after taking off from Jakarta. And the incident brings the African carrier’s death toll to 482 across 22 fatal incidents since its inception in 1965 – and almost 500 more people have been injured in EA crashes and incidents, according to information from the Flight Safety Foundation. For comparison, only one British Airways flight has only ever been involved in one fatal incident: the Zagreb runway crash of 1976 when all 176 people aboard two planes died when BA Flight 476 collided with another aircraft on takeoff due to an air traffic control error. Initial reports today show considerable similarities between the Ethiopian and Indonesian disasters which involve the same plane. Today’s flight lost contact about six minutes after take-off, having requested and been given clearance to return to the airport in Abbis Ababa. 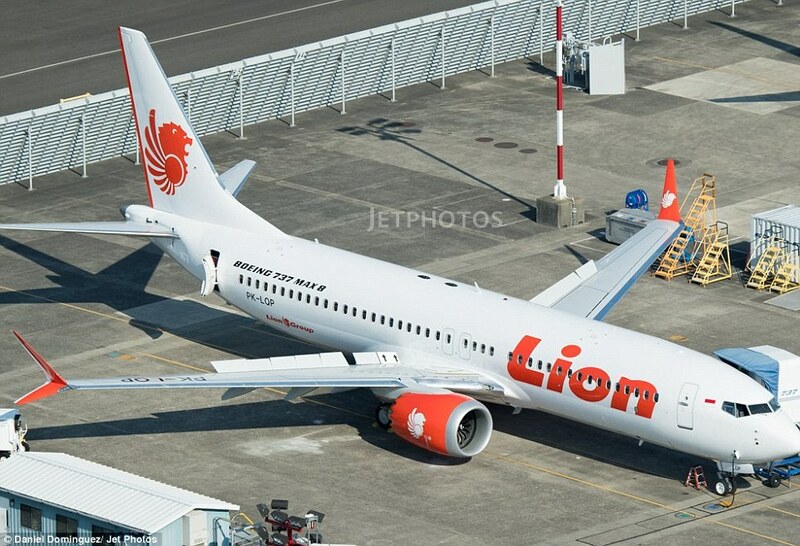 Last year, Lion Air 610 also went down minutes after take-off having requested permission to return to base. 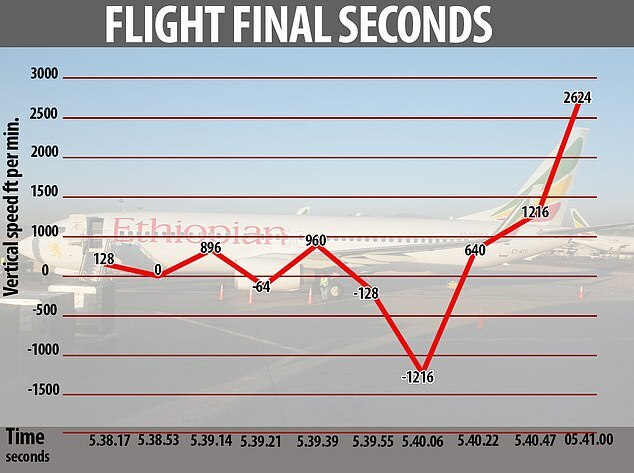 Today, telemetry shows the plane’s vertical airspeed fluctuated rapidly in the minutes and second before its crash, including in the final moments when it seems to have been locked in a terrifyingly accelerating nosedive,. 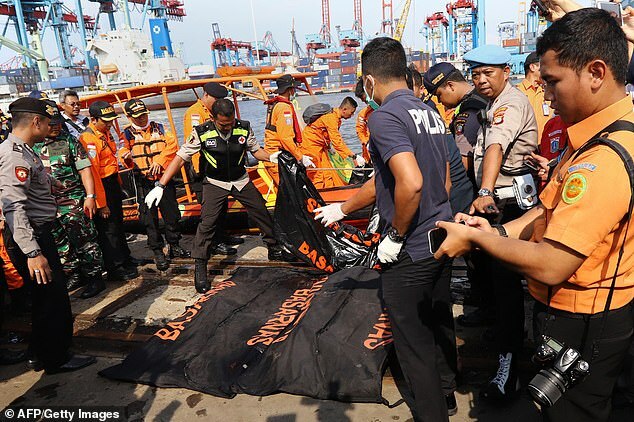 Investigations thus far by the Indonesian and American aviation authorities have concluded the Lion Air plane also hit the sea after a violent nosedive. The New York Times reports today that investigators are considering whether that dive might have been caused by updated Boeing software that was meant to prevent a stall – but that can send the plane into a fatal descent if the altitude and angle information being fed into the computer system is incorrect. The change in the flight control system, which can override manual motions in the Max model, was not explained to pilots, according to some pilots’ unions. After that crash, Boeing said that it was continuing ‘to evaluate the need for software or other changes as we learn more from the ongoing investigation.’ It was unclear if the company had made any changes. Today the Daily Telegraph reported that the US Federal Aviation Administration (FAA) issued an Emergency Airworthiness Directive in November last year in relation to one of the flight systems on the Boeing 737-8 and 737-9 series of aircraft. That was published following the crash of Lion Air flight 610 on October 29. The FAA directive warned that an ‘angle of attack’ censor, which is supposed to help to prevent a plane from stalling, could lead to an ‘excessive nose-down attitude, significant altitude loss, and possible impact with the terrain’. This ‘unsafe condition … is likely to exist or develop’ in the Boeing 737-8 and 737-9 designs, the directive concluded. Boeing last night announced it will be sending a technical assistance team to the site of the crash. When asked by the paper about the travel alert appearing to coincide with the crash, a US State Department official said: ‘On March 8, US Embassy Addis Ababa released an alert related to concerns about traffic in the city due to expected protests. 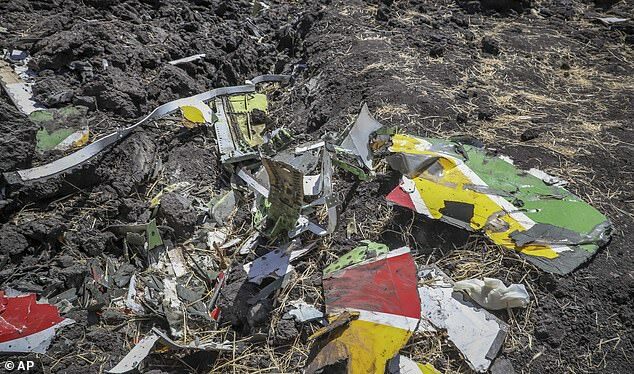 In a statement on Sunday, Boeing said it was ‘deeply saddened’ to learn of the crash of Ethiopian Airlines Flight 302. ‘A Boeing technical team is prepared to provide technical assistance at the request and under the direction of the U.S. National Transportation Safety Board,’ the company said. 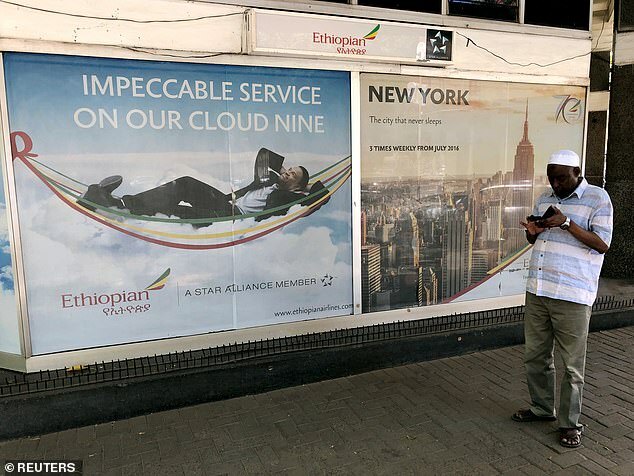 The airline does have a better safety rating and a newer fleet than some neighbouring operators – a number of African airlines are banned outright from EU airspace including the flag-carrier of neighbouring Eritrea. But in addition to 16 fatal incidents costing 102 lives in the 1960s, 70s, and 1980s; the airline has now suffered six fatal incidents in the last thirty years, including other two huge tragedies. In 1996 after a hijacking and a failed water landing, 125 people died on Flight 961 in Moroni, the capital of the Union of the Comoros in the Indian Ocean. 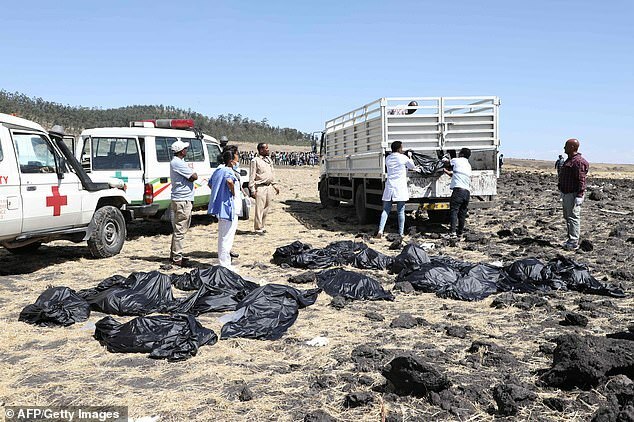 And in January 2010, 82 passengers and eight crew died when EA flight 409 from Beirut to Addis Ababa slammed into the Mediterranean shortly after take-off. Boeing’s 737 is the world’s most-sold passenger jet family and is considered one of the industry’s most reliable. The MAX 8 is the latest version of the aircraft, which Boeing rolled out in 2017 as an update to the already redesigned 50-year-old 737. By the end of January, Boeing had delivered 350 MAX jets out of the total order tally of 5,011 aircraft.